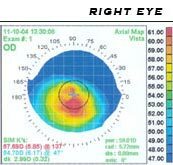 Radial keratotomy (RK) is a refractive surgical procedure to correct myopia (nearsightedness) that was developed in 1974. It has been superseded by newer operations, such as photorefractive keratectomy (PRK), LASIK, Intra-Lasik, Wavefront Lasik, and others. Although rarely done now, millions of people underwent RK in the 80’s and 90’s around the world with over a million procedures done in the United States. In addition, many of these RK patients had LASIK in an attempt to undo damage caused by their initial RK surgery. 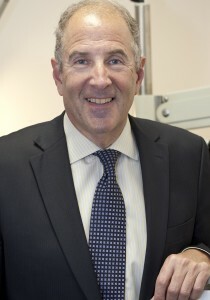 Many RK patients also underwent additional RK procedures followed by one or more LASIK procedures. In every instance, the additional procedures only exacerbated the problem. 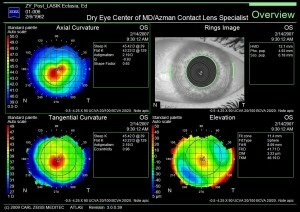 In recent years, advances in specialty lenses including Scleral lenses and other unique advanced lens technologies have become available which will allow patients to see clearly and comfortably once again, without the risk of further surgery. The images below show how one of our patients, Sharon B., sees at night after having RK surgery vs. how she now sees with a Scleral lens. This entry was posted in Post LASIK, PRK, and RK Problems, Scleral lenses and tagged Lasik, Myopia, Photorefractive keratectomy, Radial Keratotomy, Refractive surgery, Scleral lens, Surgery, United States on June 7, 2013 by Irwin Azman.